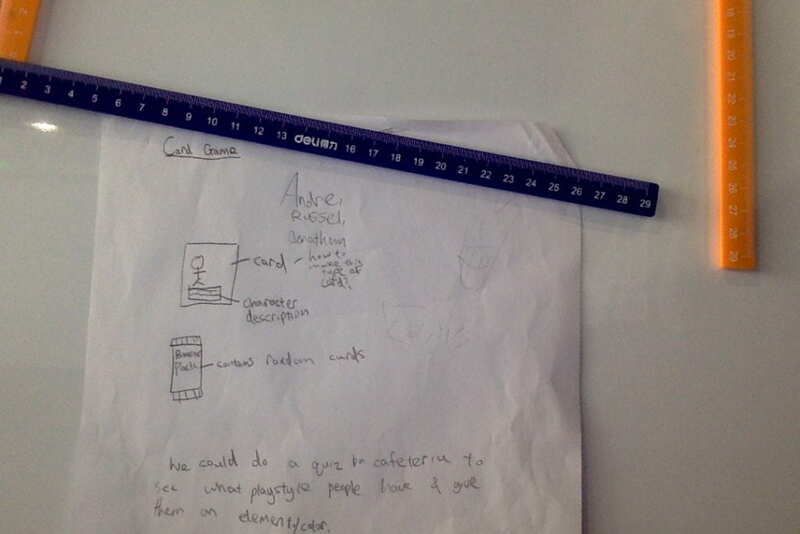 This is our initial prototype, there is a card of the character and a description of its stats. 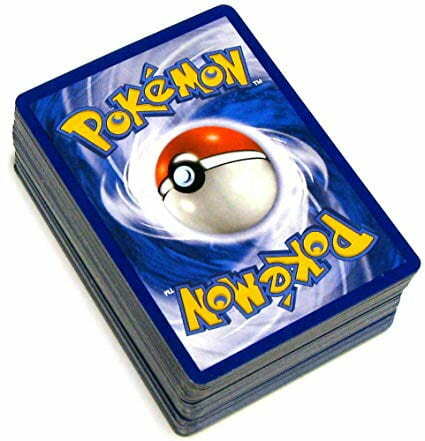 We also planned to make booster packs for the cards. 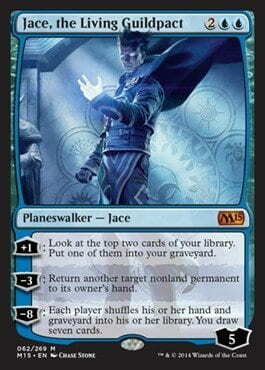 Our inspiration is Pokémon and Magic the Gathering. We kind of merged the two games together and ISB-fied it to create our game. Our idea is a card game and our ideal customer is Es or Ms boys. Based on our interviews, it shows that males are more interested in our battle card game. A photo of Mr. Frank trying to help us get our Labquest working. 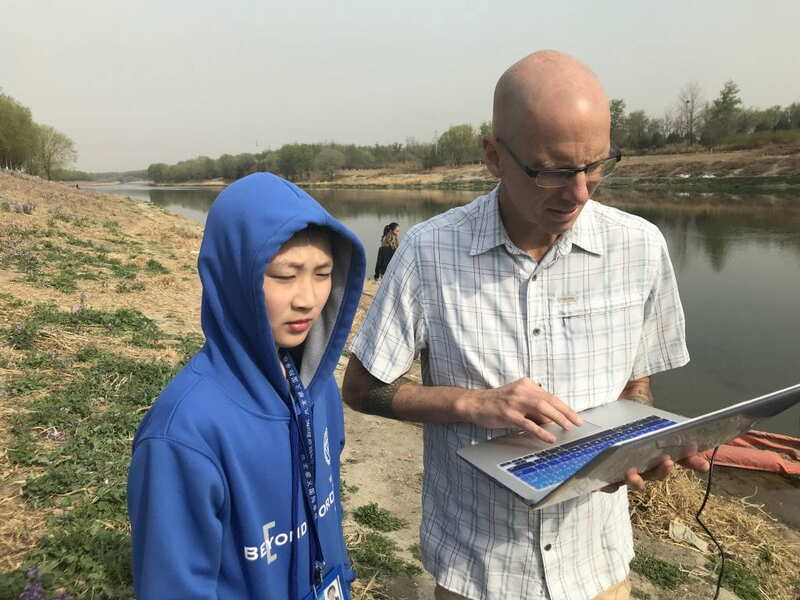 Today was April 8th of 2019, FA7 went to the Wenyu river to take data once again. The weather was a lot warmer than the previous times we visited the Wenyu River. There are signs that its Spring because it’s warmer, and the flowers have bloomed. We once again, we were going to take data on the temperature and the dissolved oxygen of the water. Unfortunately, our lab quest (the tool we use to collect the dissolved oxygen) didn’t work, so we only took data on temperature. In April, the data on site 1 was 16 degrees Celsius and the data on site 2 was 15 degrees Celsius. Note: The parts that are missing is because either our tools malfunctioned and we couldn’t collect the data, or site 1 wasn’t created yet. I noticed that on the graph of the dissolved oxygen, both sites rose in mg/l at first, but then site 2 rose slower and site 1 plummeted down. I notice that in the graph of the temperature, data is more understandable and consistent. Both temperatures drop at first, then they rise again, because of the change in the season and temperature. Next time when we collect data, I wonder if the two sites will still rise in temperature while they increase and decrease in dissolved oxygen. This is because I notice that the rise in temperature is because of the season changing, I wonder how warm the water will be when it’s summer? 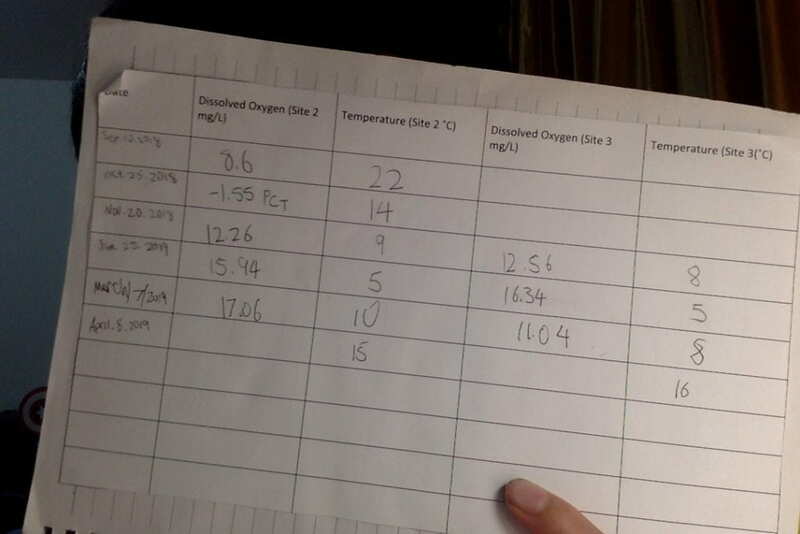 Also, I am very curious to see the data of the dissolved oxygen because the data is very inconsistent and we have no idea what is causing it to increase/decrease. ]I think something ISB does well in terms of being friendly towards the environment is using recycling bins/boxes. 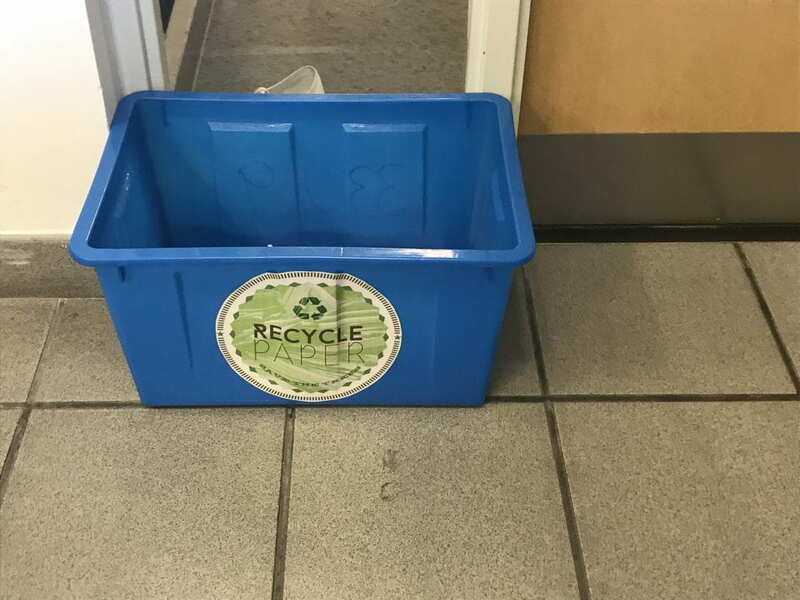 There is a recycling box in almost every classroom, the recycling boxes can help us reuse a lot of things. This way, we can reduce, pollution, trash, and we could also save many marine animals. This happens because when there is a reduction in trash, pollution will start to slowly decrease as well. Things like plastic and other harmful things to the environment will start to disappear as well. 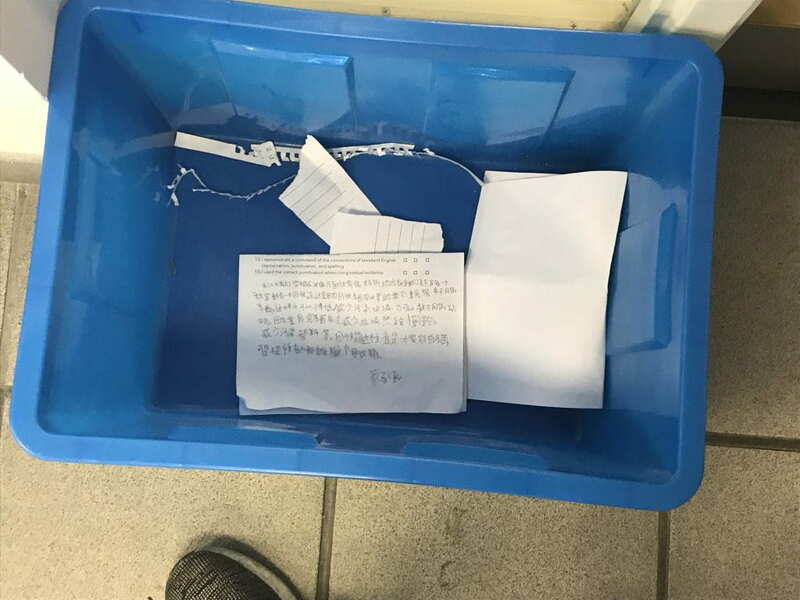 Having a recycling box in almost every classroom is a very good idea but not everyone would use it, then, the recycling box wouldn’t be effective. That’s why there should be a rule that you always have to throw leftover paper and scraps in the recycling box so we help the environment. My piece with my teammates. Looking back on Project ReCharge, I learned that freedom and power are related. For example, in child labor, since the children have less power, they have less freedom and are forced to work in harsh conditions. On the other hand, the owners or the people that use child labor have more power than the children, so they can order them around and they have more freedom. Also, in drama, we learned about different statuses and how they might affect someone’s life or body movement. The people with higher status have the power to order the lower statuses around. Before this project I used to think that it is important to understand multiple perspectives about an issue than to understand one or two. now I still this is important. For example, if you have more than one or two perspectives, you understand how people who are related to that issue feel. During project recharge, it was important to interview Doug Cougle about child labor in our school because I learned that not all people who have child labor in their supply chain aren’t bad people. They don’t just decide that they want to use child labor. Most people don’t even know they have it in their supply chain and even if they do, it is very difficult for them to remove it. 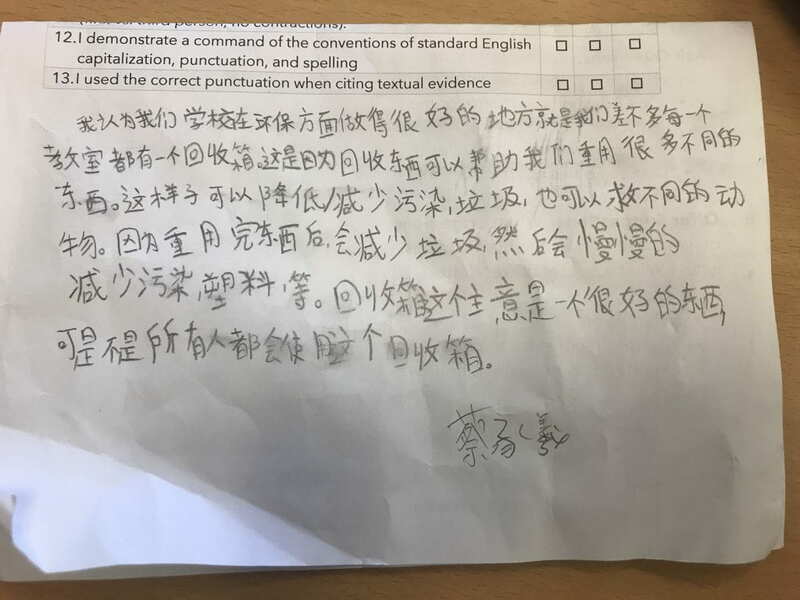 Before the interview, I thought that whoever had child labor in their supply chain were bad people, now my thoughts and opinions have changed. For example, I learned that when some people have child labor in their supply chains, they don’t just “use” child labor. And you can’t just remove it from your supply chain. It is a very complicated issue and you need to investigate and track down where child labor is being used in you supply chain, and you need to find a way to remove it from your supply chain without customers being unsatisfied. Because child labor chocolate tend to be cheaper, and when a company is using FAIRTRADE or not using child labor, the price of the chocolate will increase. I wonder I have is, how will future companies remove child labor from their supply chain? Or will child labor never be stopped? Should Freedom of Speech be Allowed? This is the skit that I made with my two friends about freedom of speech. In this skit, all characters will consider multiple viewpoints and why that viewpoint might have its benefits. The characters will also have doubts and disagree with each other. 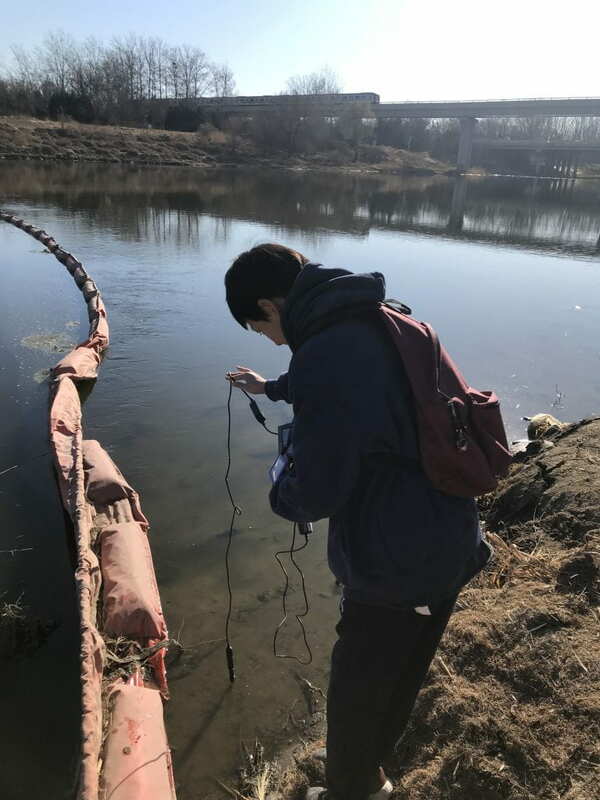 Today was March 7th of 2019, FA7 went to the Wenyu river and the purpose of the trip was to continue collecting data on the Wenyu river and analyze it. 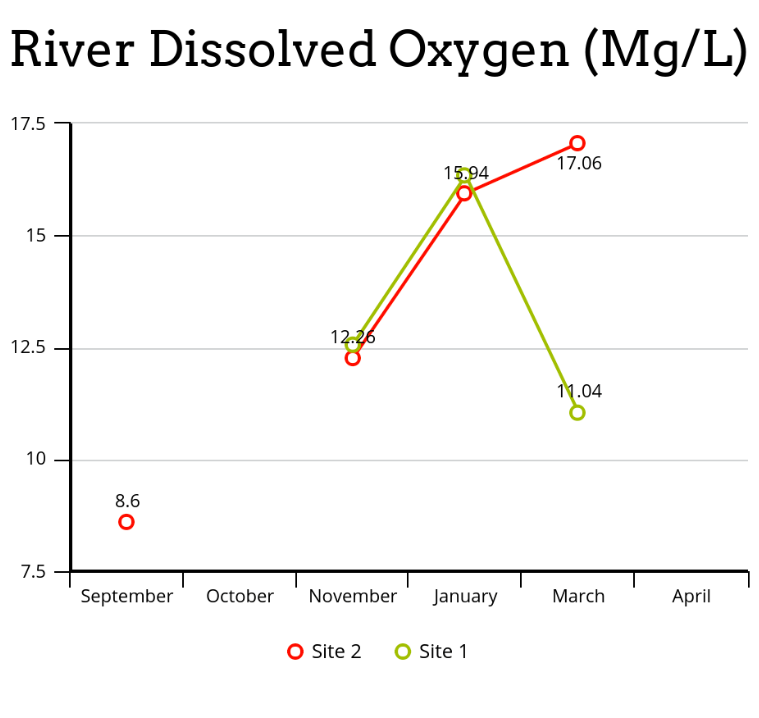 In March, the dissolved oxygen for our site 2 was 17.06 mg per liter, and the temperature was 10 degrees Celsius. The dissolved oxygen for sight 3 was 11.04 milligrams per liter, and the temperature was 8 degrees Celsius. The dissolved oxygen for sight 2 increased while the dissolved oxygen for site 3 decreased by a lot. I notice that in site 2, the relationship of the dissolved oxygen to the temperature is very inconsistent, sometimes when the temperature increases, the dissolved oxygen decreases. And sometimes when the temperature increase, the dissolved oxygen also decreases. For example, the temperature went from 9 degrees Celsius to 5 degrees Celsius while the dissolved oxygen went from 12.26 mg/l to 15.94 mg/l. In this case, temperature decreased while dissolved oxygen increased. 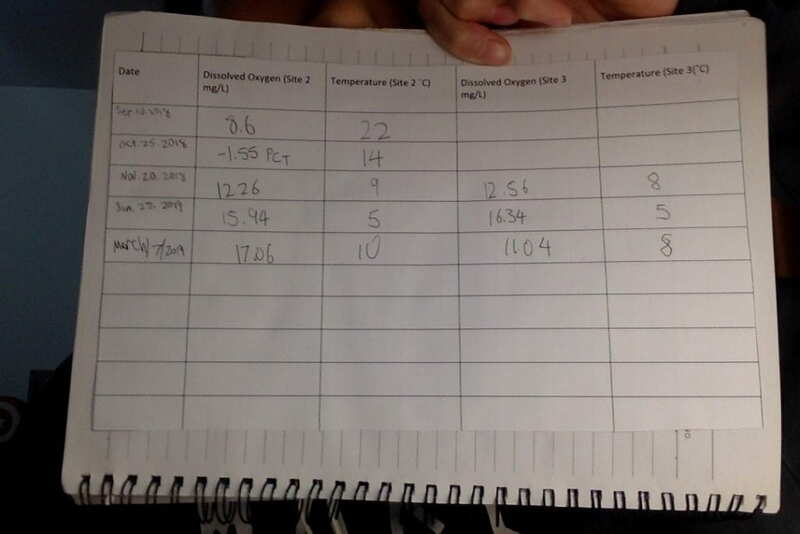 But in another example, the temperature went from 5 – 10 degrees Celsius, and the dissolved oxygen went from 15.94 to 17.06 mg/l. Both data points increased, which is different from the previous set of data. However in site 3, when the temperature increases, the dissolved oxygen decreases, and vice versa. For example, when the temperature went from 8 to 5 degrees Celsius, the dissolved oxygen decreased and went from 12.56 to 16.34. And when the temperature went from 5 – 8 degrees Celsius, the dissolved oxygen decreased and went from 16.34 to 11.04. Next time we collect data, I wonder what the relationship of the dissolved oxygen and temperature will be in site 2 because the data in site 2 has always been inconsistent so it’s hard to tell what the data is going to be next. 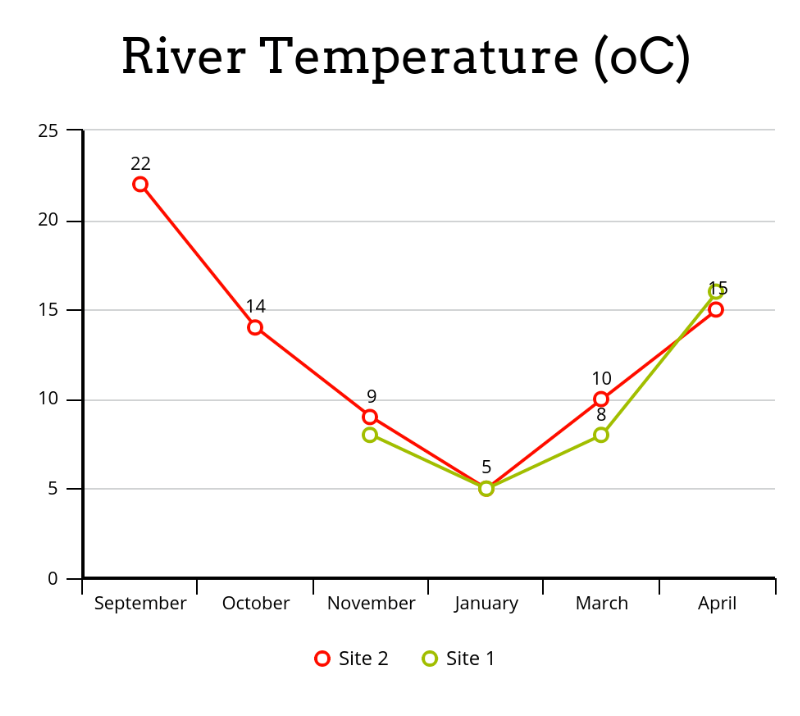 On the other hand, for site 3, since the temperature is getting warmer, my estimation is that the temperature will get warmer while the dissolved oxygen will decrease. This week was a very fun week and I had quite the journey. We first learned martial arts: BJJ and Muay Thai. Although I have some background and know BJJ and Muay Thai it was fun to learn it again with friends. After that, we learned how to incorporate martial arts into stage combat using a technique called “knapping”. Where you or your partner hit their body part to create the sound that replaces the sound of a punch/kick. This is to make it seem as if you are actually punching your partner in the show. A challenge that I had to overcome was doing the entire fight sequence with my partner without one of us messing up, stage combat is dangerous because if someone doesn’t dodge at the right time, you might actually injure them. The way my partner and I overcame this challenge was to just repeat the parts we struggled on over and over again until it became solid muscle memory. Skills that I developed was being more creative and collaborative as well as doing stage combat techniques. I improved in my collaboration and creativity because I had to be creative to create interesting scenes and I had to collaborate with my teammate(s). I also learned about knapping in stage combat and also perspective, if you’re in an angle where the audience can see you or your opponent knap, you need to change the angle. The highlight for me this week was creating an epic combo with my partner and repeating it until we got it down. We recorded ourselves and saw how realistic and cool the fight scene had looked and it really motivated us to keep creating more ideas. 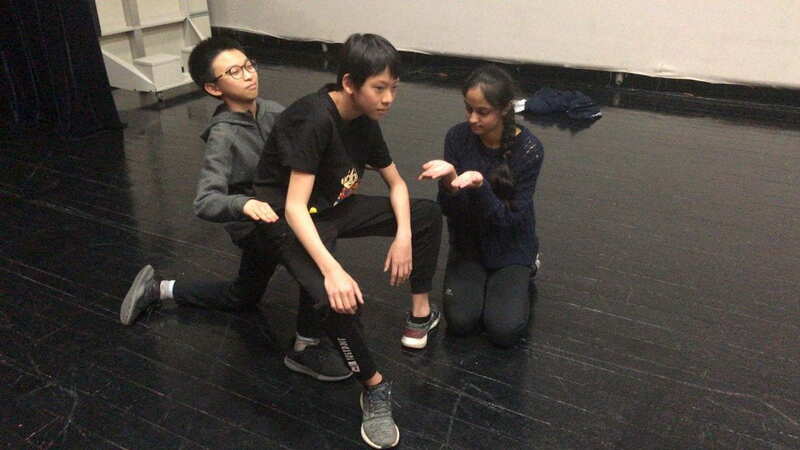 I chose the creativity L21, because my group had to be creative to create an interesting and realistic fight scene. I thought I grew in this area because I learned to record myself and learn from my mistakes. 1 example of how I used creativity is when I contributed to the team when we were making the prologue to make interesting and special movements. I found it challenging to create a high quality fight scene in one week, but I still achieved it. Looking back at this project, I learned a lot of Muay Thai and Brazillian Jiu-Jitsu techniques and moves. 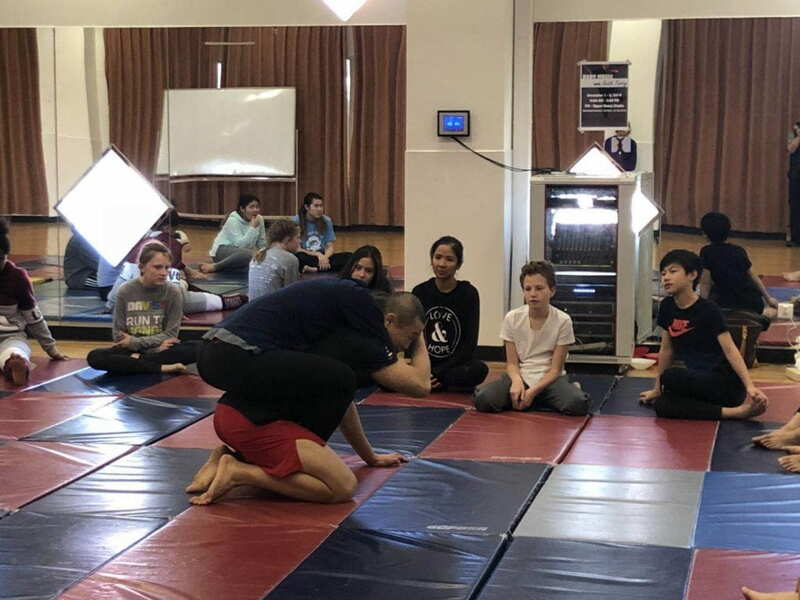 Although I have some background and already know Muay Thai and BJJ, it was fun and interesting to incorporate it into stage combat. Knowing what I know now, one thing I would do differently is to use my time more efficiently during practice, I did memorize my part and I knew how to perform it smoothly. But when I was with my partner, in some rare occasions, we would make a mistake. We made a small mistake in our part of the show. The mistake I learned from the most is to distance yourself from your opponent when doing stage combat, I realized this when I had accidently jabbed my partner twice using my right arm. When we distance ourselves, we can still make a realistic combat scene, while keeping safe. One skill I can use in the future is the combat we learned, I can use BJJ and Muay Thai to defend myself. I could even combine them, to defend myself from someone bigger than me. Another could be learning to choreograph a scene, this was tough for me because I had to think about what angle the audience would see us from, and where we would knap (make a fake punching sound). If we did it in front of the audience, they would see the knap. However, if the knapper made their back face towards the audience, they can’t see the knap. One thing I am proud of is creating a realistic fight scene with realistic sounds and movements in one week. I was also proud of working as a group with the other members to create a prologue with nice, synchronized movements and speech. Overall, this ignite week helped me grow because I improved my fighting technique and learned how to make realistic stage combat scenes. Techniques that I will try to use in my choreographed fight is Muay Thai and Brazilian Jiu-Jitsu moves that can help me make the fight look more professional and realistic. Skills I hope to develop is projecting my voice, thinking about the perspective of the audience, and making fake battle moves look realistic. Resources that can help me develop these skills are practicing and watching tutorials on youtube. Recording myself could also be a good idea since if we put the iPad in the perspective of the audience, we can see what they see and how to improve our choreography to make it more interesting and realistic. For projecting my voice and the perspective of the audience and also making my choreography, Ms. Northcott can help me with this. Ms. Di Falco can help me with my Muay Thai and Brazillian Jiu-Jitsu technique. Another person could be me, I could record and see what my technique looks like and how I could make it look better. I could also record and see if I can hear what I am saying and I can see if the knapping of the punches is loud enough. Ideas that I used to generate ideas was watching some fight scenes on youtube and also recording myself because this way, I could put myself into the shoes of the audience and I could think about what the audience would think is interesting and maybe even funny. The 4 days that I had with the Ignite week was very fun because I learned a lot of things from fight moves to projecting my voice. I also got to work as a team with people to create interesting, realistic, choreographed fight scenes. We are trying to choreograph and perform a Shakespeare stage fighting show. The show is designed for audiences who visit the exhibition, we are hoping to entertain the audience and make the fighting look realistic. The things that inspire me are action movies because the fight scenes look realistic and look like the actors are actually fighting and making physical contact. 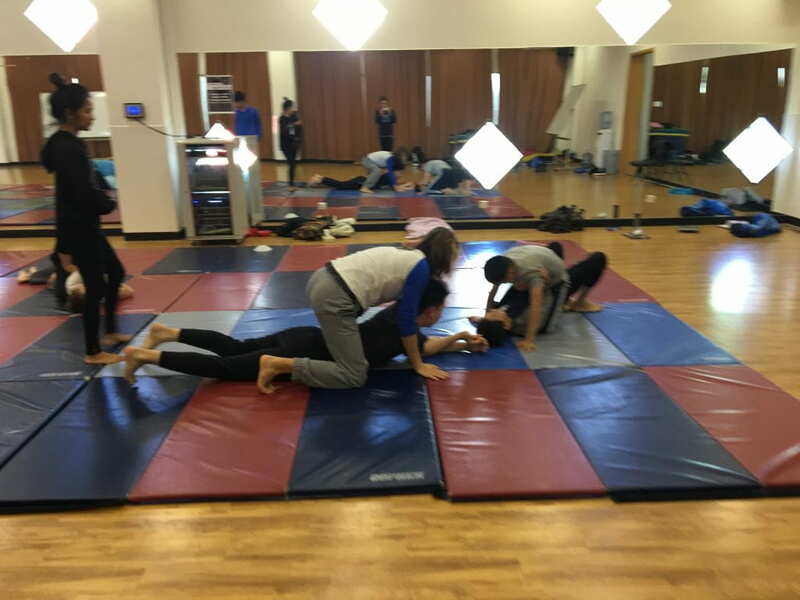 The part of this project that will be challenging is to make the fighting look realistic because we need to use the appropriate sounds to make the action look real and as if we are actually making physical contact. The further research that we need is to learn more Muay Thai moves and some BJJ moves to make our fight more convincing.